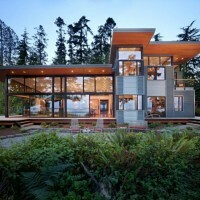 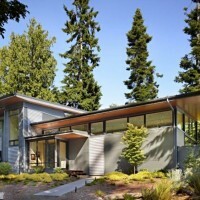 Nils Finne of FINNE Architects designed this contemporary home in Port Ludlow, Washington State. 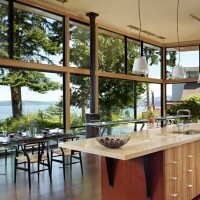 The Port Ludlow Residence is a compact, 2400 SF modern house located on a wooded waterfront property at the north end of the Hood Canal, a long, fjord-like arm of western Puget Sound. 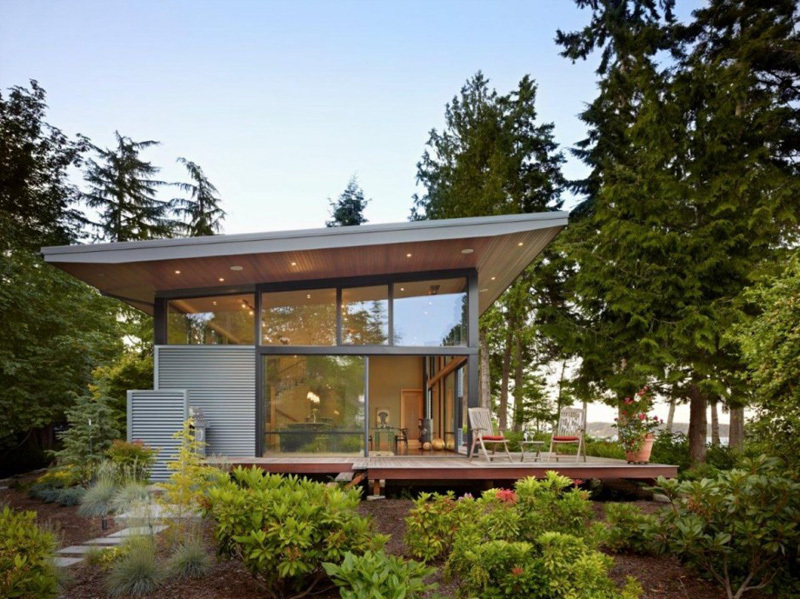 The house creates a simple glazed living space that opens up to become a front porch to the beautiful Hood Canal. 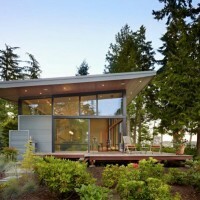 The east-facing house is sited along a high bank, with a wonderful view of the water. 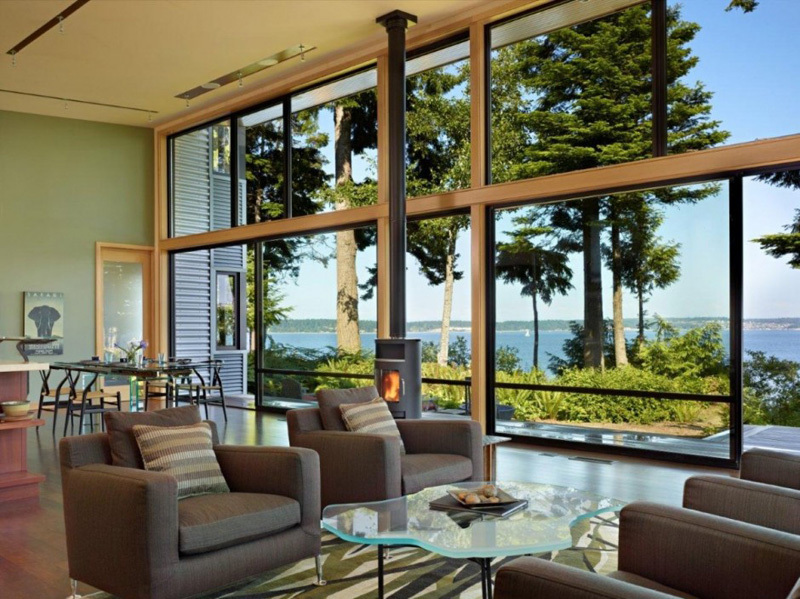 The main living volume is completely glazed, with 12-ft. high glass walls facing the view and large, 8-ft.x8-ft. sliding glass doors that open to a slightly raised wood deck, creating a seamless indoor-outdoor space. 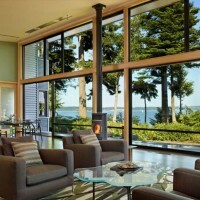 During the warm summer months, the living area feels like a large, open porch. 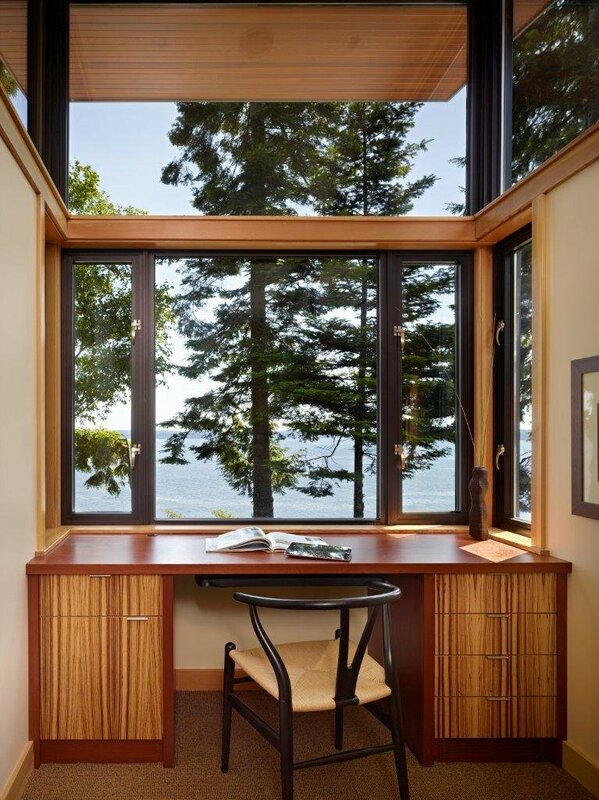 Anchoring the north end of the living space is a two-story building volume containing several bedrooms and separate his/her office spaces. 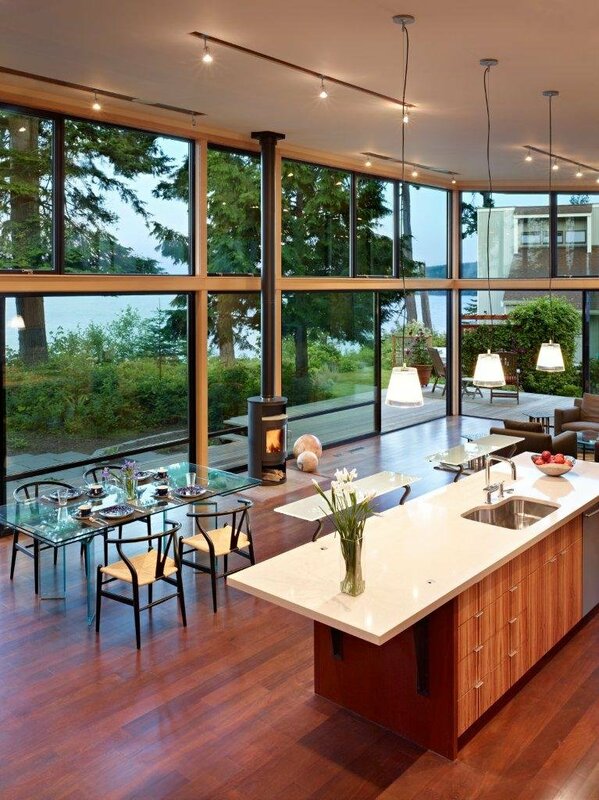 The interior finishes are simple and elegant, with IPE wood flooring, zebrawood cabinet doors with mahogany end panels, quartz and limestone countertops, and Douglas Fir trim and doors. 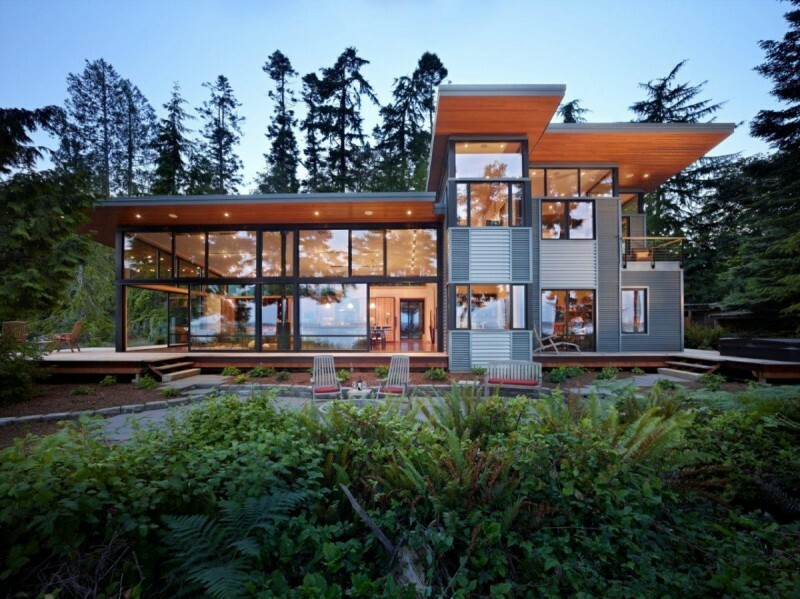 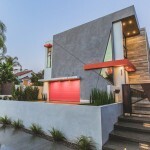 Exterior materials are completely maintenance-free: metal siding and aluminum windows and doors. 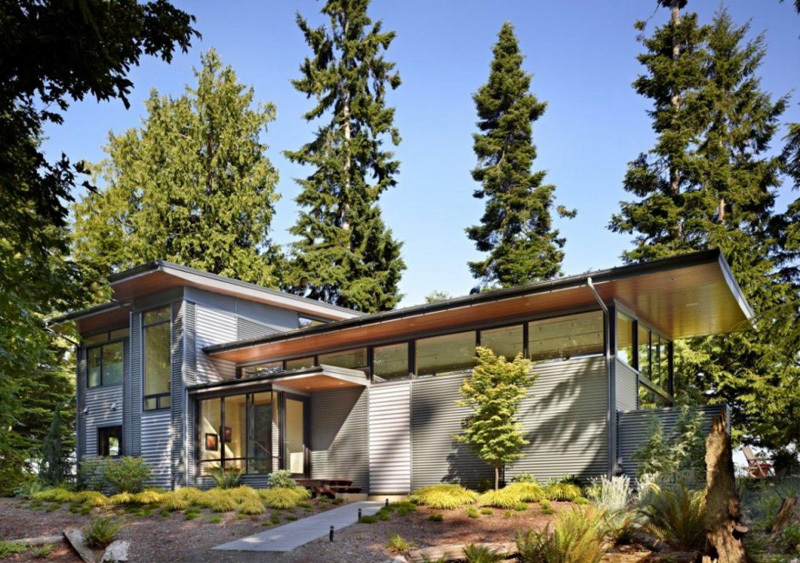 The metal siding has an alternating pattern using two different siding profiles. 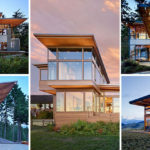 The house has a number of sustainable or “green” building features, including 2×8 construction (40% greater insulation value); generous glass areas to provide natural lighting and ventilation; large overhangs for sun and rain protection; metal siding (recycled steel) for maximum durability, and a heat pump mechanical system for maximum energy efficiency. 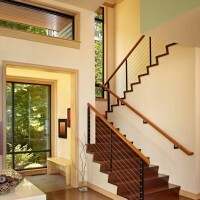 Sustainable interior finish materials include wood cabinets, linoleum floors, low-VOC paints, and natural wool carpet.